If you haven’t heard about the Top Escape Rooms Project, you should check it out. Seventy enthusiasts around the world got together and voted on the top 25 escape rooms! In this episode, we caught up with Rich Bragg (also the co-founder of ClueKeeper), to discuss how he started the Top Escape Rooms Project. Instead of talking about the winning rooms, we talk more about the details on the genesis of the Enthusiast Choice Awards, or the “Braggs” as we like to call them. Posted on December 28, 2018 by Errol Elumir. It is now tradition to catch up with Lisa and David Spira of Room Escape Artist. We talk about a lot of things, and for a full time signature breakdown, check out REA’s post! This is the photo talked about in the podcast. Photo courtesy of EscapeRoomZandvoort.nl. Posted on December 14, 2018 by Errol Elumir. For Escape Room and BBC’s Sherlock fans comes a new game called The Game Is Now. 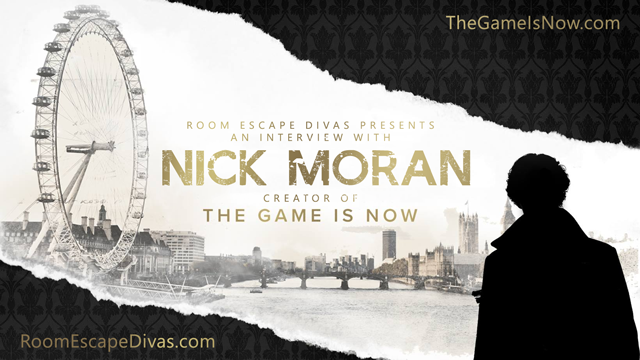 Manda and Errol get a chance to talk to the game director, Nick Moran, best known for creating one of the top escape room companies in the world, Time Run. Posted on November 30, 2018 by Errol Elumir. The Divas discuss their trips to Montreal and they also debate which has the greater rooms: Montreal, Toronto, or Ottawa? Contentious topics! Mike and Ruby at Escaparium! Posted on November 2, 2018 by Errol Elumir. Over a thousand escape rooms, wow! 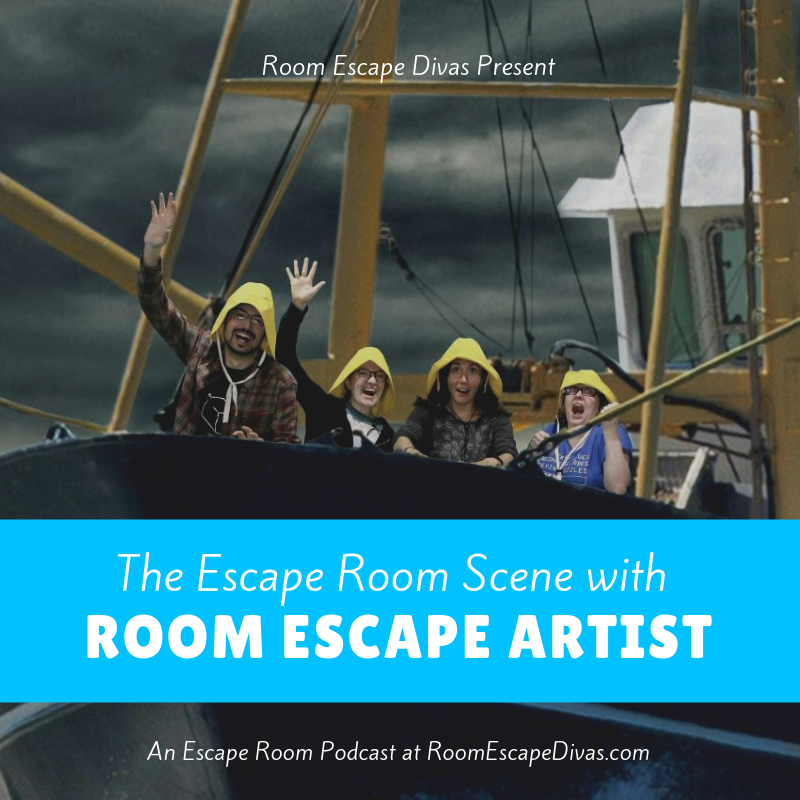 The Divas chat with Sera Dodd and Sharan Gill, also known as S2, about escape rooms enthusiasm, game and puzzle design, and ERIC, an escape room conference in the UK. And Manda got a chance to meet up with them!! Posted on October 12, 2018 by Errol Elumir. The Divas get together to discuss Errol’s post 13 Rules for Escape Room Puzzle Design. You may want to read the document first, because we reference it a lot! Posted on September 28, 2018 by Errol Elumir. Errol was in Los Angeles and he had a wonderful time. In this episode, he meets up with a number of escape room enthusiasts and interviews as many as he can. He also gets distracted a lot. Posted on September 14, 2018 by Errol Elumir. In this episode, Errol gets into a nerd competition with David Hernly. They also talk about escape room software and David's own Mythric Mystery Master, a software platform for running escape rooms! Posted on August 31, 2018 by Errol Elumir. Escape Rooms pretty much started in Asia, and their market has matured over the years. The Divas have a great chat with Yolanda Chiu of Asia Escape Game. She's from Taiwan and has been doing research on the escape room industry in Asia. Manda first met her when Yolanda gave a talk about at Up The Game 2018. Posted on August 17, 2018 by Errol Elumir. 71 - Errol Visits Boston Escape Rooms! Errol and his family went to Boston! There, they met up with some other enthusiasts (Lisa and David Spira, James Cobalt), checked out Make Way for Ducklings statues, and also did eight escape rooms. It was an expensive trip but fun! Listen in as Errol talks and talks and talks about his experiences with Boston Escape Rooms. You may not know, or care, but Errol has a daily webcomic about his life. He's quite the narcissist. Posted on August 3, 2018 by Errol Elumir. In this podcast, all the Divas chat with Russell Leasure, who will be holding a seminar at Transworld's Escape Room Conference called How to Unlock Your Game Master's Potential. Listen in as we discuss hiring good game masters, being a good game master, and ghosting. Posted on July 20, 2018 by Errol Elumir. Delaney Anderson and her crew of Portable Escapes run escape rooms at different comic conventions! Listen in as Manda and Errol discuss with her the ins and outs of running an escape room for the geeky masses. Posted on July 13, 2018 by Errol Elumir. Stephanie Frey hosts the Games in Schools & Libraries podcast here on Inverse Genius, and we got the chance to talk about her work creating escape rooms in libraries, doing an escape room camp, and using escape rooms to help educate children! Posted on June 22, 2018 by Errol Elumir. Having finished her whirlwind tour of the Netherlands, Manpans rounds up her thoughts on the Up the Game conference she attended. And Errol went to visit his parents in Calgary and did seven rooms over the long weekend. Listen in as they ruminate on narrative, puzzle difficulty, and Manda's drinking habits. Posted on May 25, 2018 by Errol Elumir. Manda Whitney was just in the Netherlands attending the escape room conference Up The Game! She got a chance to talk to a whole host of people, and for your reference, we've included a timeline for the very first time. We should be doing this for all of our podcasts. Posted on May 11, 2018 by Errol Elumir.